Bruce Beck at Corcovado Mountain in the Tijuca National Forest. 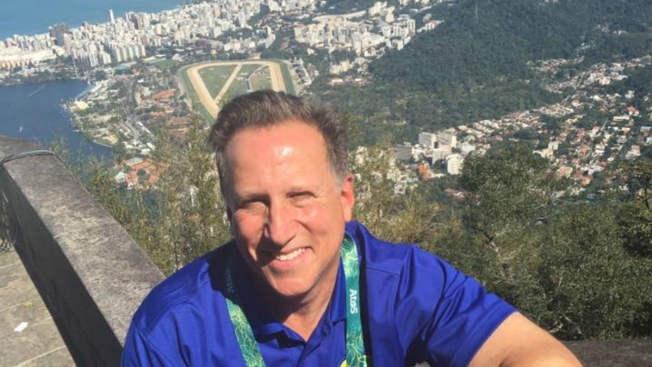 Bruce Beck is in Rio to cover the Olympics! He shares his insights and observations from the Olympic Village, the streets of Rio and Brazil's iconic beaches. Watch Bruce on NBC 4 New York and keep up with him throughout the day by following @BruceBeck4NY on Twitter, Facebook, and Instagram. Bruce tries his hand at table tennis on the last day of Rio 2016. Going toe to toe in @usatabletennis with @twangsterr - two-time Olympian! I hung tough! Bruce talks to members of the gold-medal winning women's basketball team! Great to catch up with @tina31charles of @nyliberty & Sue Bird of Syosset, NY after they captured gold in RIO! What a remarkable run for the @usabasketball women - 49 straight wins and 6 consecutive Gold medals! Bruce goes one-on-one with the fastest man in the world, Usain Bolt! Another Gold for the World's Fastest Man @usainbolt_official! He might be the world's greatest showman too! Bruce catches up with Dalilah Muhammad and her family as she goes for gold in the 400 meters hurdles! Big night for @dalilahmuhammad_ and her family as she goes for Gold in the 400 meters hurdles! Great local story - Jamaica, NY; Benjamin Cardozo HS; Novas Track Club; Rochdale Village! What an athlete! Bruce interviews a NJ high school phenom who made her debut in Rio. Bruce sits down with the most decorated Olympian of all time! We'll hear from gymnast @lauriehernandez_ tonight on @nbcnewyork 4! The pride of Old Bridge, NJ captured a silver medal today on the Balance Beam to go with her team gold! She's only 16! What a talent! Bruce watches Usain Bolt win the 100 meter race and the title of world's fastest man! Bruce celebrates bronze with the history-making women's fencing team and improvises with a little help from an ice cream vendor! Nothing like Athletics (Track & Field) at the Olympics! Tonight I took in mlive the Women's 100 Meter dash! Ice Cream and WNBC! Yes we got creative just moments ago and used the local Good Humor Man to help with the stand-ups! We were in need of an umbrella desperately to block the hot Rio sun so we hired our buddy to take the umbrella off his ice cream wagon and work in television for a few minutes! The shot looked great and cameraman @ed_alonzo is now looking to hire him full time in the future - lol! Bruce talks to Katie Ledecky's uncle, who is also the new owner of the New York Islanders. Bruce gives us an update on Day 6 and catches up with Carmelo Anthony. Bruce interviews a fencer from the Bronx who won a silver medal. Bruce meets a very courageous boy from New Jersey, and the face of NBC News. My favorite picture of the Olympics so far! It was with Darius Ziabakhsh who was invited to the Games by the @mcdonalds Olympics Kids Program! He suffers from a rare disorder that affects several vital organs. I did a feature on him about his experience in Rio which included attending the Opening Ceremony! What an inspirational and courageous kid from New Jersey. I just loved interviewing him. Bruce keeps tabs on the winning women's field hockey team -- and gets a care package! Congrats Melissa Gonzalez & @usafieldhockey - taking the Olympics by storm! 2-0 with wins over Argentina & today, Australia! Great story brewing! Bruce meets with Team USA's silver medal-winning fencer Alexander Massialas. It's silver for @amassialas - so happy for the 22 year old from San Francisco! My 4th Olympics covering @usfencing! I root hard for this team! Can't wait to see my locals perform! On Day 1 of the Olympics, Bruce meets a broadcasting legend! Bruce meets a New Jersey wrestler who is seeking redemption in Rio. The day before the Opening Ceremony, Bruce interviews a local Olympian who is breaking barriers and making history! With just two days until the Olympics begin, Bruce catches up with a star boxer from New Jersey. We are live in Rio - literally now! First live shot in the books! Join us at 5 and 6 on @nbcnewyork 4! Three days until the Olympics! Bruce is getting ready by interviewing local athletes in Rio. On Monday, Bruce visited some of Brazil's top tourist sites: The Christ the Redeemer statute, which is one of the new Seven Wonders of the World, and Copacabana beach. Finally made it to Copacabana Beach on a magnificent 80 degree in Rio! Prepping hard for Olympics! Visited the iconic landmark Christ The Redeemer today in Rio! The 124 foot statue is visible from anywhere in the city. It is listed as one of the new 7 Wonders of the World! Good to be with NBC Camerman extra-ordainaire, Eddie Alonzo!